The tarot (first known as tarocchi, also tarock and similar names), is a pack of cards (most commonly numbering seventy-eight), used from the mid fifteenth century in various parts of Europe to play card games such as Italian Tarocchi and French Tarot. From the late 18th century until the present time the Tarot has also found use by mystics and occultist in efforts at divination or as a map of mental and spiritual pathways.Tarot was not widely adopted by mystics, occultists and secret societies until the 18th and 19th centuries. The tradition began in 1781, when Antoine Court de Gebelin , a Swiss clergyman and Freemason, published Le Monde Primitif, a speculative study which included religious symbolism and its survivals in the modern world. The Major Arcana (greater secrets), or trump cards, consists of twenty two cards without suits; The Fool, The Magician, The High Priestess, The Empress, The Emperor, The Hierophant, The Lovers, The Chariot, Strength, The Hermit, Wheel of Fortune, Justice, The Haned Man, Death, Temperance, The Devil,The Tower, The Star, The Moon, The Sun, judgement and The World. The Minor Arcana (lesser secrets) consists of fifty six cards, divided into four suits of fourteen cards each; ten numbered cards and four court cards. The court cards are the King, Queen, Knight and Jack, in each of the four tarot suits. The traditional Italian tarot suits are swords, batons/wands,coins and cups; in modern tarot decks, however, the batons suit is often called wands, rods or staves, while the coins suit is often called pentacles or disks. The terms “major arcana” and “minor arcana” were first used by Jean Baptiste Pitois (also known as Paul Christian), and are never used in relation to Tarot card games. Cover of the Thoth Tarot deck, designed by Aleister Crowley and painted by Lady Frieda Harris. The cover is similar to the illustration of the Two of Disks. 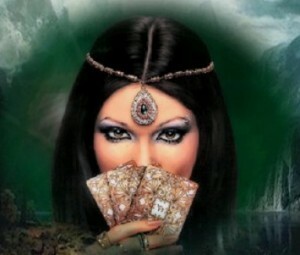 Tarot is often used in conjunction with the study of the Hermetic Qabalah. In these decks all the cards are illustrated in accordance with Qabalistic principles, most being under the influence of the Rider-Waite-Smith deck and bearing illustrated scenes on all the suit cards.